Five Barns — Jeff Svitak Inc. There are five main programmatic elements to this house: social/entertaining, cooking/eating, sleeping/privacy, guest housing, and services. There is one barn uniquely and proportionately designed to contain each programmatic element. 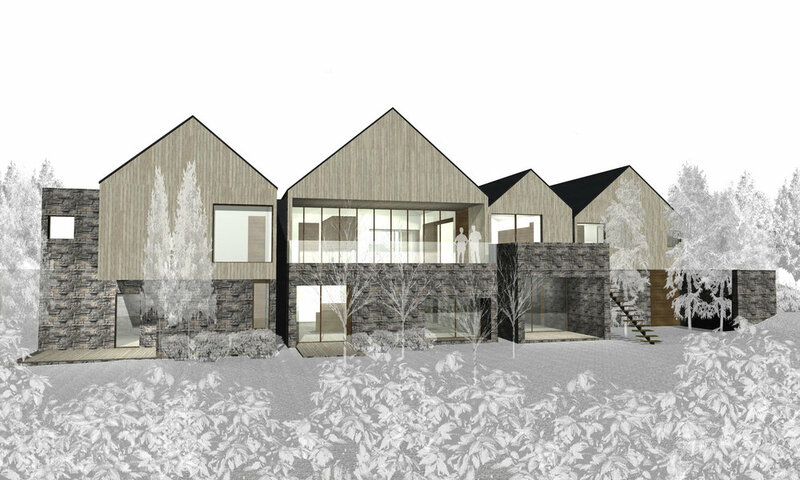 The five barns are then positioned to allow for interior and exterior circulation. The connecting elements are slim steel boxes, 2’ in width, which allows for all the cabinetry to neatly fit inside, while keeping the internal spaces of the barns clean and clearly defined on all sides. The main level contains a large front courtyard, which opens to the dining and living spaces. An oversized rear wood deck opens the living room up to views of the Rocky Mountains for relaxing and entertaining. The basement takes advantage of the sloping site by allowing for a walk-out, retreat style space for housing guests.